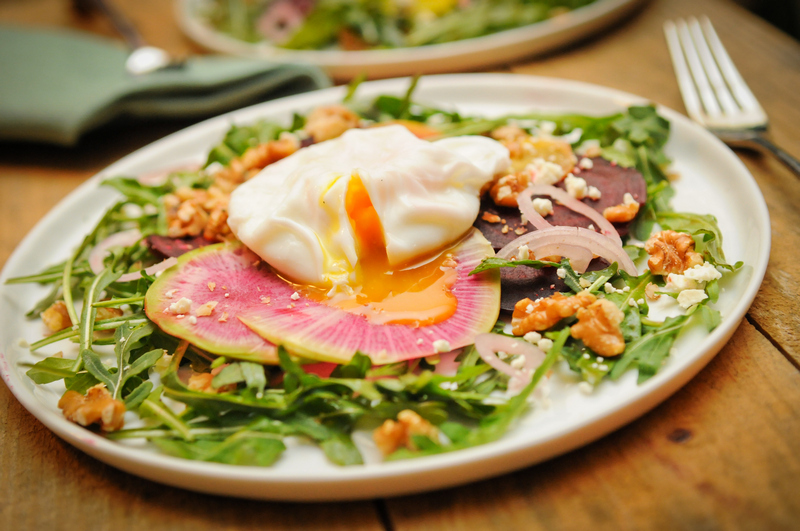 Shaved Radish and Beet Salad with Poached Egg — potato chips are not dinner. I'm not sure if there is anything better than a poached egg. That velvety, rich yolk tastes good with almost everything.The best part is it's such a pure way to prepare an egg- no oil, butter, or frying involved. I can't lie, it took a lot of practice and experimentation to learn how to perfectly poach an egg. I've tried multiple vinegar to water ratios, cider vinegar, small pans, big pans, furiously whisking to create a water vortex...I could go on. But don't let it scare you, after some trial and error you will master it and want to make them every day. Use the freshest eggs you can get your hands on. The older an egg is, the thinner the white is, meaning it will spread faster in the water while poaching. I also try to use free range eggs. Poke a hole in the bottom of the egg (the wider part) with a pin. Not too deep as to pierce the membrane, just the shell. Place it in 2 quarts of boiling water (a slow, barely bubbling boil) with 1/3 cup of vinegar in it for precisely 10 seconds. Remove with a slotted spoon, let cool, then crack the egg as close to the surface of the water as possible. Cook for 3-4 minutes, depending on how hard you like your yolk. The past two weekends I celebrated my 28th Birthday with many crepes, mimosas, and leftover Valentine's Day candy so I wanted to eat on the lighter and healthier side this week. I have been making a conscious effort to incorporate more vegetables into my diet lately, and I have really come to love beets and radishes! So when I came across some gorgeous golden and purple beets and watermelon radishes in the market, they inspired me to make this beautiful salad. If you've never had watermelon radishes before, they taste like a regular radish but a bit milder. If you can't find watermelon radishes, regular ones will work just fine in this recipe. They are so pretty to look at though , aren't they? This salad made a great weeknight dinner because it was healthy and light, while still being filling and satisfying. Clean and remove leaves and stems from beets, and boil them for about 30 minutes. I boiled the golden and purple ones separately so the yellow ones retained their beautiful color. Place them in a bowl of ice water to cool before peeling. The skin should rub right off. The radishes can be eaten raw and don't need to be cooked. Slice your beets, radishes, and shallots. I used a mandoline to get mine paper-thin but you can slice them yourself if you don't have one. Season your arugala with salt and pepper, then toss it with the balsamic vinegar and olive oil. Dress your salad sparingly, it doesn't need much as the poached egg yolk is nature's best sauce. Arrange the radishes, beets, and shallots on a bed of arugala and sprinkle goat cheese and walnuts on top. Place poached egg on top and season with salt and pepper, and a squeeze of lemon, if desired. Awwww yeah, look at that poached egg! 1. Clean and remove leaves and stems from beets, and boil them for about 30 minutes. I boiled the golden and purple ones separately so the yellow ones retained their beautiful color. Place them in a bowl of ice water to cool before peeling. The skin should rub right off. 2. Slice your beets, radishes, and shallots. I used a mandoline to get mine paper-thin but you can slice them yourself if you don't have one. 3. Season your arugala with salt and pepper, then toss it with the balsamic vinegar and olive oil. 5. Arrange the radishes, beets, and shallots on a bed of arugala and sprinkle goat cheese and walnuts on top. Place poached egg on top and season with salt and pepper, and a squeeze of lemon, if desired.